ow it may seem odd for a Pamlico boy to use a a great Chicago radio announcer to make a point, but based on the title of this column I like a baseball metaphor. Coming off the bench, I am remembering the first Casey at Bat published by the Nashville Graphic in 1978. The late Tom Wilson never exercised his red pen to delete copy (Publisher’s note: The TownDock publisher is inconveniently alive, and has been known to occasionally use the delete key), but he did observe once, “Everyone’s entitled to his own misguided opinion. I’ll never write a column without remembering my gratitude to Tom Wilson and his brother, Joe, who still survives. Joe ran the production end of the paper. He convinced Tom to give me an editorial chance. I look forward to swinging a bat again for all that is good about Pamlico County, from Olympia to Fulford’s Point, from Silver Hill to Wilkerson’s Point. I might try to find answers to intriguing questions that inquiring minds have not yet asked. And I’ll use this column to remember great people whose greatness may not have been measured by the national media. Such a great person was the late Merritt Watson, Sr. At the Bean in Oriental, I have heard more conversations about boating than Carter has liver pills. But I have not heard any stories about the likes of Mr. Merritt. 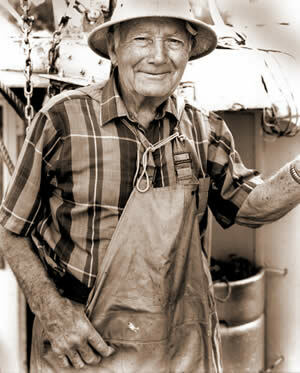 He was one of the very first Pamlico County fishermen to venture beyond the waters of the Pamlico Sound into the Atlantic blue, way over half a century ago. Mr. Merritt had no benefit of a GPS, only a compass. Yet, he always found his way to where he was going off the New England coast, and his way back to Lowland. Mr. Merritt honored me ten years ago this summer by pausing in front of my lens. Lines drawn by decades on the water covered his face, but those lines conveyed a gentle expression. I wonder what kind of stories could Mr. Merritt have told at the Bean. And I wonder how many of us would have been wise enough to listen. As for intriguing questions that inquiring minds have not yet asked, I am hoping a task force can soon be appointed to study why one passes a sign that says Minnesott Beach – City Limit on the way to a building with a sign that says, Minnesott Beach – Town Hall. That’s also true for Arappyhoe and a few other municipalities around the county. If a municipality has a city limit, why doesn’t it have a city hall instead of a town hall? The two major intra-state ribbons streaming their way through the county, i-55 and i-306 are bringing unprecedented cultural changes to the region. Only on that short stretch of i-33 paralleling the Intra-coastal waterway, from Hobucken to Aurora, does change seem less ominous. But intra-states 55 and 306 are now nothing more than clones of US 50 streaming through Fairfax County in Northern Virginia on the way to Hollywood on the Potomac. In that area, one passes from Annandale to Falls Church to Arlington to Alexandria where one sign post in the middle of a block of a busy four lane street notes that one is leaving one municipality and entering the next. 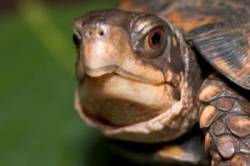 And out from the congestion of city life in the county, I am happy to say that I had to stop dead in the road on Janeiro Road this past Sunday so the people ahead of me could help a box turtle across the road. I cheered them on. I’ve heard it said that cars are killing these terrapins faster than they are reproducing. I say “Bravo” and “thanks” to those two ladies who did that kind act. But I am searching my soul to ask if I would also stop to help a possum across the road. Coming up, I’ll swing a bat for revamping the system of markers on our waterways that reveal the channels. Later there may be lessons on how to pronounce Alliance, a diatribe on barbecue and collards, and a discourse on where Olympia ends and Reelsboro begins. As well as directing PR for Pamlico Community College, Ben Casey is a photographer and photo essayist. You can learn more about Ben and his books at www.bencaseyphotos.com.